The day did not start as usual. It was excursion day and we had to get up earlier in order to catch the coaches to our respective destinations. While most of the delegates chose to drive to Brighton, I decided to go to Oxford since I wanted to have some sort of comparison to the life in Cambridge. The journey to Oxford lasted for some two and a half hours until we got out of the coach in the centre of the city. The first impression I had was that this place was very vivid. It was not that nice sleepy town. On the contrary, the atmosphere was rather urban. Once I left the coach I was situated between a playhouse and the Ashmolean museum. It felt like being at least in a regional capital. After some minutes a local guide joined us and she gave us an interesting tour through the city. We visited the main sights and heard some lively stories about the origins of the city, the university and its colleges and the ramifications of local events on the history of Britain. Again, like at Cambridge, there was this feeling that whatever happens in this place might be of importance for much more people, maybe worldwide. Apart from politics and religion, where Oxford played a role during the time of the English Reformation, it was the place, where famous authors like J.R.R. Tolkien and C.S. Lewis lived, worked and had discussions about the ideas which they were working on. When we passed the former office of C.S. Lewis we even saw some things that might have inspired him when he was working on “The Chronicles of Narnia”, like the lantern in front of the building or the lion on the entrance door. During our stay at Oxford we were also confronted with some more recent literature. More precisely, literature that served as the basis for a movie. In our case it was “Harry Potter”. Once the tour was over and we had some lunch, a friend and I went to Christ Church, where we visited some sights of the movie. 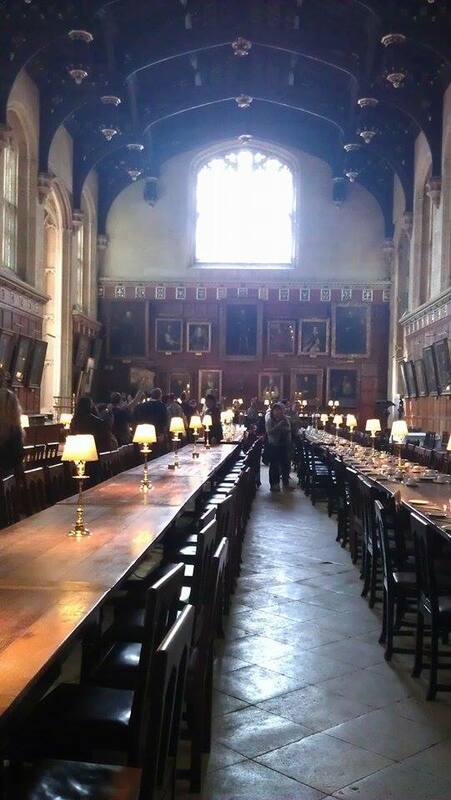 Among them was the college’s dining hall which served as a main inspiration for the dining hall in the movie. Just look at the tables and the ceiling. Regardless of the movie, while going through the hall it was quite impressive to see all those famous names under the portraits that hang there. It must be very encouraging to eat there every day. But we did not have enough time to think about this in more detail since the bus would depart in a couple of minutes. So, after a short look into the nice cathedral, we headed to the meeting point, bought a cup of tea and got onto the bus which brought us safely back to Cambridge.